For the first time, two astronomers have explained the diversity of galaxy shapes seen in the universe. 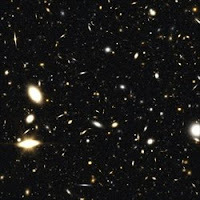 The scientists, Dr Andrew Benson of the California Institute of Technology (Caltech) and Dr Nick Devereux of Embry-Riddle University in Arizona, tracked the evolution of galaxies over thirteen billion years from the early Universe to the present day. Their results appear in the journal Monthly Notices of the Royal Astronomical Society. Galaxies are the collections of stars, planets, gas and dust that make up most of the visible component of the cosmos. The smallest have a few million and the largest as many as a million million (a trillion) stars. American astronomer Edwin Hubble first developed a taxonomy for galaxies in the 1930s that has since become known as the ‘Hubble Sequence’. There are three basic shapes: spiral, where arms of material wind out in a disk from a small central bulge, barred spirals, where the arms wind out in a disk from a larger bar of material and elliptical, where the galaxy’s stars are distributed more evenly in a bulge without arms or disk. For comparison, the galaxy we live in, the Milky Way, has between two and four hundred thousand million stars and is classified as a barred spiral. Explaining the Hubble Sequence is complex. The different types clearly result from different evolutionary paths but until now a detailed explanation has eluded scientists. Benson and Devereux combined data from the infrared Two Micron All Sky Survey (2MASS) with their sophisticated GALFORM computer model to reproduce the evolutionary history of the Universe over thirteen billion years. To their surprise, their computations reproduced not only the different galaxy shapes but also their relative numbers. “We were completely astonished that our model predicted both the abundance and diversity of galaxy types so precisely”, said Devereux. “It really boosts my confidence in the model”, added Benson. The astronomers’ model is underpinned by and endorses the ‘Lambda Cold Dark Matter’ model of the Universe. Here ‘Lambda’ is the mysterious ‘dark energy’ component believed to make up about 72% of the cosmos, with cold dark matter making up another 23%. Just 4% of the Universe consists of the familiar visible or ‘baryonic’ matter that makes up the stars and planets of which galaxies are comprised. Galaxies are thought to be embedded in very large haloes of dark matter and Benson and Devereux believe these to be crucial to their evolution. Their model suggests that the number of mergers between these haloes and their galaxies drives the final outcome – elliptical galaxies result from multiple mergers whereas disk galaxies have seen none at all. Our Milky Way galaxy’s barred spiral shape suggests it has seen a complex evolutionary history, with only a few minor collisions and at least one episode where the inner disk collapsed to form the large central bar. “These new findings set a clear direction for future research. Our goal now is to compare the model predictions with observations of more distant galaxies seen in images obtained with the Hubble and those of the soon to be launched James Webb Space Telescope (JWST)”, said Devereux.